Way, way back in June, Steve and I headed to Porto, Portugal's second city, for a long weekend. The reason for our trip to NOS Primavera Sound, the Porto counterpart of the festival I'd experienced in Barcelona back in 2014. Safe to say that I fell head over heels in love with Porto from the moment we arrived. The food, the architecture, the culture. There is just so much going on in this lovely, little city that the 4 days we spent there felt like an absolute treat. Whilst we did all the touristy things on my list I'd definitely love to go back and visit again. We flew to Porto on the Wednesday night after work. The festival started on the Thursday and having experienced the Barcelona festival after an incredibly early flight I didn't want to make the same mistake again. We stayed in an Airbnb and whilst it wasn't the best apartment I've had the pleasure of renting, the location was grand and it did the job. We started our first day with a visit to São Bento train station to check out the beautiful tile work. Porto is full of gorgeous tiles but the murals in the station are another level of impressive. Designed by Jorge Colaço in 1930, some 20,000 tiles depict historic battles (including Henry the Navigator's conquest of Ceuta), as well as the history of transport. Even if you're not catching the train anywhere I definitely recommend popping in to take a look at the impressive work. Down the road from the station, we came across Porto Cathedral which is a lovely building which great views over the city. Next to the Cathedral is the tourist office where we bought ourselves 4-day Porto Cards. We knew we'd be doing a lot of sightseeing as well as using public transport to get to the festival so it made sense to pick up one of these for the duration of our stay. A 4-day card costs €33 which is a fantastic deal, we must have saved over €100 each with these. We tried to find Igreja de Santa Clara, a lovely gothic church, which is meant to be situated near the cathedral but alas we couldn't not pin it down so instead we wondered around checking out more great views over the city. We stopped at Mercearia das Flores for lunch. This cafe come deli is full of local delicacies such as tinned sardines and cured ham. Great food, great value, and great atmosphere. I cannot recommend this place enough. After lunch we strolled around the Ribeira area, admiring the beautiful buildings. Porto really is a feast for the eyes architecturally speaking. We popped into Instituto dos Vinhos do Douro e Porto for a glass of port and to find out why this wine is so special to the Douro region. Before making it down to the river we visited Igreja de São Francisco, an impressive Gothic church, and Casa do Infante, a less exciting medieval town house. The river front is such an exciting place for a stroll. Tourists and locals alike spill out onto the pavements from the river side bars and restaurants meaning the atmosphere is buzzing all day long. The famous plaza, Praça da Ribeira, is surrounded by grand tiled townhouses overlooking a picturesque stretch of the river. We were hoping to catch the Funicular dos Guindais at the base of the famous bridge, Ponte Dom Luís I, back up the hill but it was closed which meant we had approximately 2371247 stairs to climb instead. All in a good days exercise I guess. Porto is super hilly so do bare this in mind when you're out for a long day sight seeing. En route back to the apartment we had a quick look around Centro Português de Fotografia. Unfortunately most of the museum was undergoing a refurbishment which meant there wasn't must to see. A shame as I do love a photography gallery. We stopped for a drink at A Sandeira do Porto which was fine, nothing special. It was then time to head back to the apartment to change into our festival gear and catch the metro to Parque da Cidade for day 1 at the festival. Our first night at the festival was fantastic fun. Having experienced the concrete jungle of Primavera Sound Barcelona I was relived to find that the Porto counterpart was an oasis of green, hilly space. Both main stages are situated at the bottom of a hill which means you can lie back on the grass and relax whilst watching bands. We did this for Deerhunter and Julia Holter but decided to stand and get into the crowd for Sigur Ros who were absolutely amazing. That evening at the festival we enjoyed local foodie favourite, Francesinha. This is a Portuguese sandwich originating from Porto that's made with wet-cured ham, linguiça, fresh sausage, steak and covered with melted cheese and a hot thick tomato and beer sauce served with french fries. It was a hefty beast and whilst I did enjoy it, I didn't want to try another one any time soon. Our second day started with a visit to Capela das Almas. The magnificent azulejo panels depict scenes from the lives of various saints, including the death of St Francis and the martyrdom of St Catherine. The tile work here is some of the most intricate in the city and on par with the tiling we saw the previous day at the train station. We popped into the famous Livraria Lello book shop. The staircase in the middle of the shop really is a beautiful piece of design which of course means the entire shop is completely rammed. Don't expect this to be a relaxing booking browsing experience. We visited a couple of record shops including Louie Louie and Porto Calling, even picking up a few gems. We had a wonderful lunch at Casa Santo Antônio. We asked the waitress what she recommended and she ended up giving us an assortment of different plates including local favourite salted cod, pork and a selection of vegetable dishes. It was delicious as well as being incredible value for money. After lunch we walked up the Torre dos Clérigos which was next door to the restaurant. The tower (which isn't too bad a hike) has fantastic views over the city. I do love all the orange roofs. We finally ventured over to top of Ponte Dom Luís I. We took our time walking, taking in the views down the Douro and checking out the Mosteiro da Serra do Pilar which located on the Southern side of the bridge. Once we were across the bridge we caught Teleférico de Gaia, a 10 minute cable car ride, to the river bank. Steve and I have a bit of thing on holiday where we like to experience as many different public transport options as possible. If there's a cable car or funicular, you bet we will be going for a ride. We walked along the river before beginning a hike up the steep windy road to Graham's Port Lodge for a tour and port tasting session. I say hike in the loosest sense of the world, however when you're walking uphill for a good 30 minutes in the blinding heat without any shade you'd be complaining as well. Graham's is one of the oldest port lodges in the region and invested in it's own vineyard in the Douro Valley back in 1890. The tour includes a vast cellar where the companies many varieties of port are stored in huge barrels. I particularly enjoyed seeing the Graham's family's private collection of vintage port, some bottles were more than 100 years old. After our port tasting experience we slowly headed back to the apartment so we could catch the metro to the festival site. Day 2 at Primavera was a beautiful, sunny evening. We watched Destroyer, Brian Wilson perform Pet Sounds, Savages and PJ Harvey who were all fantastic. I can't remember what we ate that day, but we certainly did drink a lot! I love the souvenir pint glasses. Our third day started with a walk down the famous Rua Santa Catarina were we stopped at Café Majestic for brunch and bumped into Lily. Despite the restaurant being a gorgeously majestic building our meal was my least favourite from the entire weekend. The menu has a French / traditional European vibe rather than local Portuguese plus it's a bit expensive compared to the rest of the city. It's feels like they've plonked the Wolseley into the heart of Porto. We ventured out of the city centre with our first port of call being Casa da Música, home to the Porto National Orchestra. This beautiful, minimalist building was designed by Rem Koolhaas when Porto celebrated being European Capital of Culture in 2001. A short bus ride later we found the gorgeous Serralves, a cultural institution with a museum and extensive gardens. The Museu de Arte Contemporânea houses changing exhibitions as well as a permanent collection featuring works from the late 1960s to the present. The pink, art deco Casa de Serralves is a gorgeous focal point in the garden. The pink building against the vivid blue sky really is a delight. We were lucky that the gardens weren't too busy when we visit, all the better for taking photos. Another short bus ride later and we made it to the beach. We had a look around Praia do Castelo do Queijo which is a tiny little fort. Afterwards we went for a stroll along the sea front as I'm not really a sunbathing person (hello pale skin). We had a hard time finding somewhere to eat near the beach so we hopped into a cab and made it over to the festival site, earlier than intended, for the last day of Primavera. We had a chicken wrap thing which ended up looking nicer than it actually tasted. I found the food quite hit and miss at the festival. At first I thought everything looked amazing but on closer inspection, the street food scene at the festival was somewhat repetitive. We managed to have a few nice meals over the 3 days but we also ended up ordering a lot of dud options as well. Coming from London I have been so spoilt by the amazing street food on offer, especially at festivals, so when I go away it quite often doesn't compare. Anyway, enough of festival food. It was nice to has a longer evening at the festival. We managed to explore areas of the park we hadn't seen before as well as enjoying Cate Le Bon, Algiers, Chairlift and Battles. We ended up getting to the front row for Air which was unexpected. Long gone are the days you'll find me at the barrier, but every once in a while it's quite enjoyable. A good way to finish our time at the festival nevertheless. 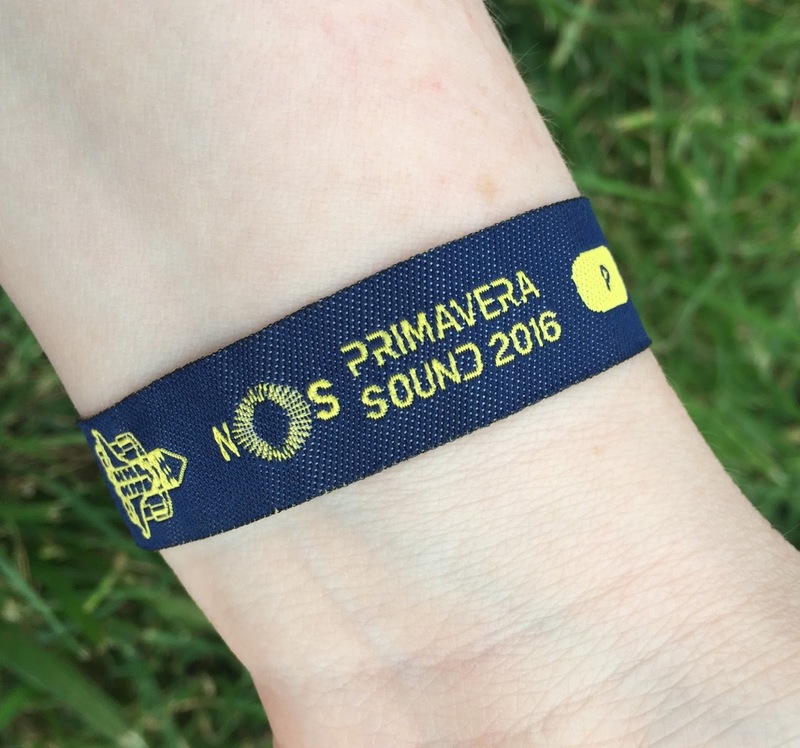 I really enjoyed NOS Primavera Sound and would visit again if the lineup took my fancy. With lots of options for food and drink there is definitely something for everyone, especially considering the booze on sale is cheapest I've ever experienced at a festival. It's a much nicer set up compared to the Barcelona counterpart but because it's a lot smaller it doesn't get all the headliners that Barcelona does. Nevertheless, the music is still great if you're into alternative indie / rock, guitar music type bands. We started the day with a 30-minute guided tour around the Palácio da Bolsa, Porto's historical Stock Exchange. For me the highlight of the tour was the magnificent Arabian Hall, a ballroom that has been gilded with 18kg of gold. We had a wonderful Portuguese style tapas lunch at Taberna do Largo. I remember the vegetables we ate in Porto tasting so fresh and full of flavour. The blood sausage was such a heavenly treat too, so rich in flavour. After lunch we took a walk around the west side of the city to visit a handful of museums, making the most out of our Porto cards. We started at Museu Nacional Soares dos Reis, which houses the city's most extensive art collection. Next up was Jardins do Palácio de Cristal to check out the beautiful Palácio de Cristal and Museu Romântico da Quinta da Macieirinha, a stately home where the exiled king of Sardinia spent his final days. Museu do Carro Electrico da Cidade do Porto was one of my favourite places, a museum all about trams. We didn't manage to get a tram ride during our time in the city which was such a shame so it was nice to see them up close in the museum. Museu do Vinho do Porto is a museum devoted to the impact of the port industry in Porto whilst Museu dos Transportes e Comunicações is about the motor and telecommunications. By this stage we we'd definitely had an overload of museums but considering they were en route back in town it made sense just to stick our heads in to see what they were like. Before we headed back to the airport, Steve and I had time to make one final stop for food. We shared a plate of octopus at the lovely, modern Cantinho do Avillez which was absolutely delicious. We had an absolutely wonderful weekend in Porto and I cannot recommend it enough, even if you're not attending Primavera. The city is packed full of culture as well as being completely beautiful for just walking around. The food is amazing as well as being excellent value and the port is delicious. We had 4 full days in the city which was more than enough time, as you can see we visited quite a few museums. 3 days would probably be a more reasonable amount of time for most people. I definitely hope to return one day, even if it's solely to sample more food and wine.